Neha's Blog: Does he love me?!? Hahahahahahaa!! Its rude to laugh, but I am actually laughing out. You are so scared that you pass out!!! I have never been scared of creatures. The only ones whom I am dead scared of are PEOPLE!! And you mentioned that my chappals are my weapon!! Partially right. For all those who still fear of the cockroaches, there is a simple solution. Buy 'Boric Oxide' powder which costs just Rs 25/-. Mix it with water to make small balls and place them all over your house where ever you feel the presence of those creatures. just keep watching the dead ones for next two days and there after your home will be cockroach free for atleast a year! Cockroaches terrify me too, but usually Dad comes to the rescue ! Hehehehe....that was a funny post. I am like insignia i guess. I dont hate them. Me being a bio student have actually dissected them a thousand times. I am scared of the lizard very very very scared yeah i had dissected something similar to lizard but not lizard. I would faint. am not scared but repulsed...they smell awful and my nose is ultrasensitive!!! You have a soul mate in me on this subject. 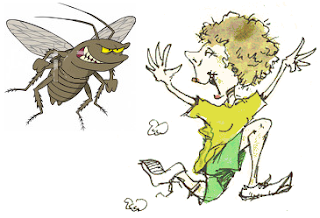 Gotta tell you this story-my daughter was 8 years old with long curly hair and a scary cockroach actually flew into her hair and couldn't get out. Okay, you now have two soul mates in this house...this kind of story is what psychiatry thrives on. When they show in the movies heroines always scared of cockroaches, I thought they are just exaggeration, but now I know that they were true:)...I am scared of reptiles.. I am not scared of cockroaches.I can't stand them. I try and finish them with whatever, be a Chappal or any WEAPON, I dont wait to finish them. I don't believe that lizards amuse you :( Gosh how neha ? I'm so scared of the creature..bahh ! I thought you'd talk of some nice cute guy you met on your first day in hostel; but then alas, it was a cockroach! But yes, I share this one with you! This morning, I spotted one in my room, actually following me in all directions... and without wasting a second, I grabbed Baygon, sprayed around, locked my home and left!!! This was a nice, refreshing and hilarious post! I think whatever you resist, persists. Nice one, Neha. Happy Women's Day. yes chappal works on animals as well as human animals. 2. Because I don't like it moving when I chew it. 3. Because he ate my dinner 3 days in a row. 4. The voices told me to do it. Sorry. 5. He was "feeling" me. but, unable to understand why one should be afraid of cockroaches? anyway that depends on a person.. Very Hilarious! I always enjoy your posts..Keep writing...I have not that much of experience with cockroaches, but yes I hate creepy things and insects!! This is the only post I read , I came here through Bik's blog! I hate them,i scream my heart out if i see them,i know which movie you are talking about(it was the yuckiest movie ever made ),i understand you completely when you say that you puked .I am very scared of them ,if few of them and me are the only living beings in a room...i can die of a heart attack...breathe,breathe,huff ,huff,pant ,pant.This Insigna woman is a brave one ya.....we need to learn her combat skills. I think this one sided love affair must end . Me 2... particularly the flying variety! @ Harini, thank god I was not a bio student..
@ Nalini, ewww, poor u..
@ Sharmila, baap re..I can imagine what you must have gone through..I would have for sure died..
@ BK Chowla, they are gross..
@ Netra, welcome here..thank u for your comments..you are brave, girl..
@ SG, ewwww, those were gross replies :-S people come up with such weird excuses all the time..
@ Sundeep, welcome here..I am dead scared of them..
@ Dewdrop, welcome here..oh I agree re.. I think it's normal not to like roaches but to pass out just seeing them is not. you have to conquer that fear..
try spraying strong laundry soap suds at this little monster cockroach..and watch it do a breakdance for a few seconds and then die. you are lot bigger than this roach and most certain, the roach's fear of you is faR more intense than your fear of it. and one more thing..get a sprayer full of strong solution of laundry soap suds...the cockroach may survive a nuclear bomb but not this one. Nice pic :). The cockroach looks so handsome and you look so pretty! Oh! They follow all their victims then, do they? Disgusting creatures! I remember the last time I visited my relatives in Guwahati... we were going out for dinner, were waiting by the car for my aunt & niece... and this H-U-G-E cockroach decided to make me his prey! Oh I tried so hard to shake him off my trail... dodged left, then right... went around in circles... but the damn thing just won't leave me alone! He was actually S-T-A-L-K-I-N-G me! I didn't pass out though, but my aunt was able to hear my screams right till the 3rd floor! Phewwww! My funda in life is very straightforward for all creatures... "you stay in your space, and leave my space alone!" That's all. I don't enter their territory, and I expect them to show the same respect to my area. Wow!! The post title made me think otherwise but after reading I could relate with the picture. Nice "trio" working on the poor creatures.Guess, love follows you irrespective of the place and time.